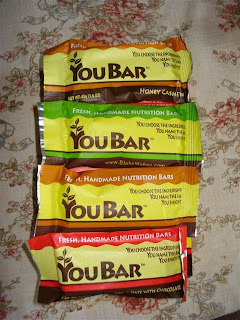 Thanks to http://www.blakemakes.com I got FREE youbars (courtesy of http://www.youbars.com) !! I'll admit...I have one left in the fridge (it's recommended you keep them in there, since they are fresh/all natural). So I'll let you know what I thought of the 3 I've eaten. (ratings 1-5; 5 being best) First I had the honey cashew one...this was the one I was most excited about. (the top one in the picture) rating:3 It had GREAT honey flavor!! But a little too health bar-ish. Kinda like a protein bar. It had a neat texture though...like the nougut in a Snickers bar. Second I had the BlakeMakes bar. (the one in the green wrapper) Rating 5 I loved it! Very granola-y (I know that's not a word)..it had all sorts of nuts and fruits..and I really loved it! 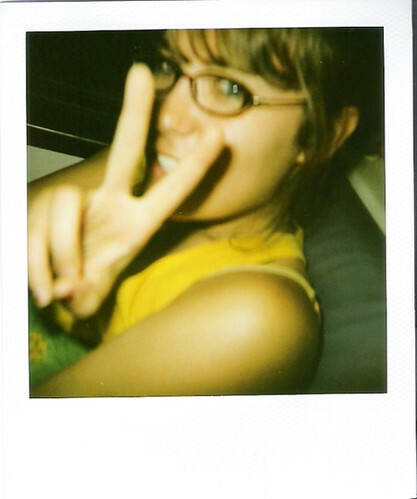 Third was the Chocolate Date one. (the red wrapper) Rating...2.5 This would have had a higher rating...but it stuck to my teeth like crazy! It was a bad choice to eat this one as a snack at work! I really enjoyed the flavor. It was reminicent of the filling on a Fig Newton. Yum! I think the coolest thing about the YouBars is that you can make them yourself...not like they send you the ingredients to do it...but you go on their website and you custom make your own bars..you pick EXACTLY what is in them. If you are calorie counting, or carb watching, you can see the nutrition label of 'your' bar and know what to tweak to make it fit your diet! Very cool! So thanks again Blake! And thanks YouBar! This sounds really neat, I'll have to check it out. Are you going to make your own bar then? How much cooler can it get? "Oh yeah, I actually had my snack bars custom-made" Haha I want some of those!